Lawman – “Tarot” – Season 4, Episode 13. 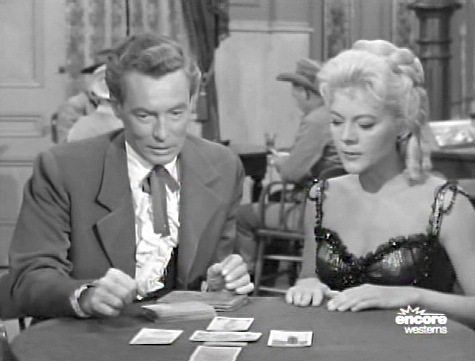 Thanks to Paul Nagy I’m adding the Have Gun—Will Travel episode, “Everyman” from 1961 (Season 4, Ep 27) that starts with a Tarot reading featuring “The Drowned Sailor, the Phoenician” (the card is never shown, but according to A.E. Waite, it’s the true name of the Hanged Man). Could “Everyman” refer to the Fool? After leaving acting, Bob McQueeney became a golf pro. After he and his wife separated, he studied to be a Catholic priest. He was ordained and for the last twenty years of his life served as the director of the Padre Pio Foundation in Cromwell, Connecticut. His wife Patricia became one of Hollywood’s most popular agents. Trivia: Ironically became a writer as per his duties as spiritual director of Padre Pio of America. Padre Pio is based in Italy. The same country where his TV character war correspondent Conley Wright was based in the The Gallant Men (1962). Thanks, as always, for the info. People are so interesting. In the prolog Paladin entertains Fortune teller Madame Destin, [played by 1940’s B-Movie regular, June Vincent] in his suite, to humor her he allows her to casy Tarot cards for him. The Wheel of Fortune, the Grim Reaper, and the Drowned Sailor face Paladin’s Chevalier of the Swords. With possible death in his near future, perhaps his only hope will be the drowned sailor. Paladin visits his pal Cus Mincus in the desert town of Temple City the next day, where it seems unlikely that he will find sailors, drowned or otherwise. However, threat of death awaits, as he meets Danceman, who has removed weapons in the town, vowing he will kill any gunfighter he meets. Danceman tells Paladin that ‘nobody owns life, we just rent it’.